This series is similar in function to the 6900 series. Slightly larget outside diameter than 6800 series, it provides better loads. Sealed bearings may be obtained with light, standard, or heavy starting torques. 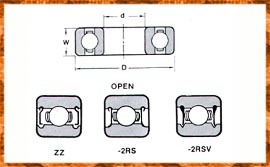 Radial clearance is selected in accordance to applications ranging from C2¡¢C0¡¢C3¡¢C4 fits. Lubricated with good grease.the sealed bearings can have better operational and lift performance.